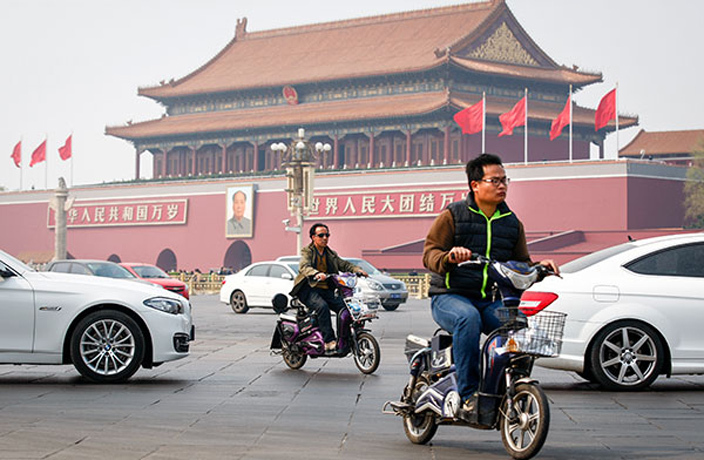 Heads up, Beijing bikers – electric bikes are soon be required to have a license and a plate number if they wish to hit the city streets, according to ECNS. The regulation was introduced earlier this month by the standing committee of 15th Beijing Municipal People’s Congress and is currently under review by the city’s law making authorities. The new proposal states that Beijing will adopt a license system and a sales catalogue for those who wish to purchase electric bikes. Electric bikes that are not found in the catalogue will be banned from sale or registration in Beijing. The rule will also set a maximum speed of 15 kilometers per hour and forbids charging bikes in certain places such as stairwells, emergency exits and residential buildings. Those who already own e-bikes but do not have a license are given three years to obtain one until they are booted off the street. Selection will be a bit more limited for new buyers as motorcycles, power-driven tricycles and four-wheelers that don’t fit the standards will be banned from being sold. This includes e-bikes that are over the speed and weight limit – 25 kilometers per hour and 55 kilograms – which pose a threat to public safety, as reported by China Daily. Additionally, the regulation of vehicles used by courier services and food delivery services – currently pending government approval – will all be drafted by Beijing’s commercial, post, traffic and police authorities. Fines will also be set for companies that produce shareable e-bikes. These fines can range anywhere from RMB5,000 and RMB30,000 for violating different traffic laws or parking illegally. With 31,000 e-bike accidents reported in Beijing in 2015 and a few recent fatal fires caused by improper e-bike charging, the new requirement comes as no surprise. Authorities have announced that they will be soon be enforcing stricter regulations on the city's bike mania. A partial takeover by ride-hailing giant Didi Chuxing has revived the once-bankrupt bike brand. Will Bluegogo's Downfall Change the Future of Shared Bikes in China? As Bluegogo faces imminent bankruptcy, the situation raises an important question: how can bike sharing companies repay customer deposits? Another new gimmicky shared bike, this time featuring Pikachu. The problem is literally putting people's lives at risk.